Southfield Firm Aims to Reduce Energy Costs for Homeowners. When new home construction hit a nosedive, Adam Duke and Jacob Smith of Go Green Energy Consulting in Southfield took to the streets. 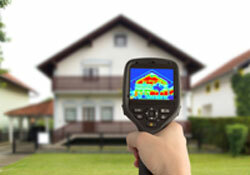 Their target: Inspect existing homes that leak energy. Offering residential energy audits and repair services, the duo is out to reduce some of the $28 billion Michigan homeowners spend each year on coal, natural gas, and oil. Duke and Smith initially sought to build energy-efficient homes using geothermal systems, solar arrays, and other green components. Part energy auditors, part detectives, Duke, Smith, and their seven-person crew inspected 150 homes last year, and they’re on pace to complete 200 dwellings this year. The audits, which cost $100 to $400 (the price is based on the size of the home), include an infrared scan of the insulation that’s behind walls and a draft test, where a large fan is set and sealed around the front door jam. Following a home’s examination, which can take two to four hours, Go Green will typically be hired to fix any problems — or the homeowner can tackle the project on their own. Duke says federal rebates and other incentives help offset some of the costs.